Buying a used car is more problematic and complex than buying a new one. If you are planning to buy a used car, you must consider to check and verify multiple things before making a deal. You may face notorious tactics of car dealers while some individuals also try to hide many facts about the car they are going to sell. You as a buyer should know many things about cars, their parts, maintenance problems and their documents and records. First of all you should decide the brand and model of the car based upon your budget, size of your family and other requirements. Then you should make a list of important things, you have to check of the car. Below are some very important tips which may be helpful to make the inspection list. Prefer to buy from an individual seller instead of a dealer. A dealer is expert in selling cars and is usually more interested in his commission on top of the price so it is hard to bargain with a dealer than the owner of the car. Moreover, first of all try to find a used car for sale from your family, friends, colleagues or at least a person whom you already know. It can save you from many obstacles as a person from your social circle will usually not cheat you. If you do not personally know the seller, even then get his detail introduction and know about him as much as possible. Ask him about his profession, home address, when he bought this car and why he is selling it etc. You may explore online classified sites e.g. OLX.com.pk , PakWheels.com etc to find a suitable used car near to you. Check registration copy of vehicle physically and make sure that it has not been tampered or changed in any way. Ask for return file, either it is with the owner or in the excise office. If owner have it, check it carefully. Check if it is duplicate. Match registration number, engine number and chassis number on documents and on parts of vehicle. Ask for original computerized number plates, which comes with vehicles registered within past few years. Check original CNIC of the owner and match it with the owner name written on the registration book. You can instantly check CNIC details of anybody from NADRA by sending its 13 digits number to 7000. Click here for more information about CNIC Verification. You can also verify registration details of any vehicle via SMS or online. Click on a link below to see more details. Rescue 15 has maintained information regarding stolen vehicles. You may contact Police or Rescue 15 to ask about the vehicle. You can also call CLPC (Citizen Police Liaison Committee) on phone number 021-35662222 for verification of cars registered in Sindh and give number plate, chassis number and engine number to get information about any car status. You may also SMS chassis number of the vehicle to 8521 to get details. This is the point where you may require a motor mechanic. Don't rely on your own expertise and also do not solely trust on seller or dealer. An experienced mechanic can give better idea about the engine and other machinery's condition. Engine and other parts under the bonnet should be clean and there should not be any sign of leakage or other wear and tear. Engine can be checked by opening the engine oil lid, and after opening it accelerate the car in neutral mode. If you see smoke coming out of oil chamber then it’s a sign that engine is not in good condition. Check engine oil to know how well the vehicle is maintained. Check suspension and gears system. Check AC and Heating system. Test drive the vehicle on both petrol and CNG. Check shock absorbers by putting your weight hard at the corners and letting it go back. Check treads and side walls of all the tyres. Do not hesitate to check all lights, signals, horns and wind screen vipers too. Never rely on the mileage of odometer as meter can be altered very easily. Look for corrosion, rust, cracks and welds on the car body or any type of filling with other material. Look closely for any variation of color on the body or any sign of repaint. Also find scratches and dents on the body. Look the floor of the vehicle under mats and carpets. Inspect vehicle from inside; Dashboard, Seat Covers, Sound System and other equipments in the car. If the mirror or windows are automatic, check all of these to operate. Confirm what accessories will be along the vehicle otherwise once deal is done, seller may start removing accessories. Take receipts of payment, transfer letter, registration book, return file, photocopies of seller CNIC and all other documents at the time of finalization of deal. Try to pay via crossed bank cheque to leave the proof of payment transactions. If a smaller car can fulfill your requirements, don't go for a bigger one. As a big car not only cost you more but its running costs - fuel, maintenance, tyres, engine oil and spares will also be higher. Do some research before buying a used car because if you get a problematic car, it will not easy for you to get rid of it. Take a test drive of the car on highway as well as on a rough countryside road. Turn the car full right and full left. And try to listen body noise. Go for the inspection of a car in day time and check under the sun light. Use flash light if necessary. Don't buy a model whose spare parts are not readily available. 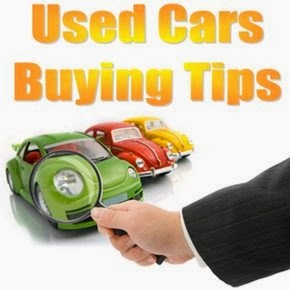 These are few major points which can help you to decide when buying a used car. Please share your own experience and tips in comments about buying a used or second hand car. Very useful app for check cars bought year and name of owner and other details like that. size of your family and other requirements. Then you should make a list of important things, you have to check of the car. Below are some very important tips which may be helpful to make the inspection list.